Average student credit card rate: 16.59 percent. The US bank prime rate remained unchanged in the second half of August, at 3.25 percent. This stability in the prime rate continues a trend that began in January of 2009. The Federal Reserve has kept the prime rate unchanged since then, as part of its policy of keeping interest rates low in an attempt to stimulate the economy. A look at prime rate history that goes back to 1949 suggests that this current streak of two-and-a-half years with no change in the prime rate is unusual, but not unprecedented. The prime rate went unchanged from September of 1960 through November of 1965, a period of more than five years. Other than that though, there has been no period without a change in the prime rate longer than the current streak. This stability in the prime rate has set the tone for most credit card offers, as changes have been few and far between in recent months. In the current survey, student rates dropped slightly, while consumer rewards credit card rates rose a little, but in either case the change to the category average was less than one-tenth of one percent. Consumer non-rewards cards, business non-rewards card, and business rewards cards were all unchanged, so stability remains the prevailing trend. Offers for non-rewards consumer credit cards were unchanged, but there was a slight increase in the average rate for consumer rewards credit cards. The latter rose by just 0.03 percent, to 17.30 percent. This bumped the overall average for consumer cards up slightly as well, to 16.53 percent from their level of 16.50 percent as of mid-August. Though the rise in consumer rewards rates is slight, it does widen the spread between those rates and rates for consumer non-rewards cards. This is a good reminder that you should periodically evaluate the financial value of the benefits you get from a rewards card, and make sure it is enough to compensate you for any additional interest you may be paying. Both categories of business credit card offers were unchanged in the second half of August. The average rate for business non-rewards cards remained at 14.47 percent, while the average for business rewards cards remained at 16.05 percent. The average rate for business non-rewards cards and for business rewards cards each represents a discount when compared to their consumer counterparts. 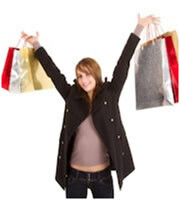 However, business rewards credit card rates represent a bigger discount. Business non-reward card rates are only 0.25 percent lower than consumer non-reward cards, while business rewards card rates are 1.25 percent lower than consumer reward card rates. Theoretically, that could make business rewards cards a greater value, if a business can find a way to use the rewards effectively. Just in time for the new school year, students benefited in a drop in the average rate for student credit cards. That average now stands at 16.59 percent, or 0.08 percent lower than the previous level of 16.67 percent. As you might expect, such a slight drop does not represent a sweeping change in student credit card offers - it resulted from one card dropping a mid-level rate tier. The average rate tier for consumers with good credit dropped slightly, while the overall average of consumer credit card rates rose a little. As a result, the reward for maintaining good credit increased by 0.09 percent, to a total of 4.11 percent. In total, IndexCreditCards.com surveys information from some 50 different credit cards, and includes multiple credit-rating tiers from many of those cards. Examples of institutions surveyed include American Express, Capital One, Chase, Citi, Discover, MasterCard, and Visa. The information compiled not only demonstrates trends in credit card rates over time, but also indicates the different values credit card companies put on different target markets (consumer, business, etc. ), as evidenced by the differences between rates for those markets. 0 Responses to "Credit card rates: Student cards dip"